The 'M2 / M3 Bradley In Action" book, the 30th publication in the Armor In Action series, was first published in 1992. It doesn't seem to be updated since then, so the "action" described in the book obviously does not cover US Army deployments to Balkan states, Afghanistan or Iraq (OIF). Actually the only real combat operation covered is Operation Desert Storm in 1991. The book is in standard "In Action" series format with 50 pages in 28cm x 21cm (W x H) size with 119 black&white photographs, several line drawings, color illustrations on the cover and color plates on two pages in the middle of book. Typically for this series no color photographs are included. In the Introduction chapter contains a short history of development of American armored personnel carriers and infantry / cavalry fighting vehicles from M2 and M3 halftracks, through M39, M44, M75, M59, M113, XM701, XM765, XM800, XM723 tracked vehicles and ending with XM2 and XM3 prototypes, renamed M2 Bradley IFV and M3 Bradley CFV when they were accepted into service. Next chapter 'M2/M3 Bradley' provides detailed description of the features of Bradley vehicles and differences between infantry and cavalry versions. In this chapter we find a lot of detail shots of early Bradleys, quite useful for modelers. Also given are very well done scale drawings of M2 IFV in four views. The scale of drawing is not given, but it seems to be about 1/47. There are some small errors noticeable on these drawings, like wrong shape of the cargo hatch on the top of the hull, but in general they are very well detailed and accurate. 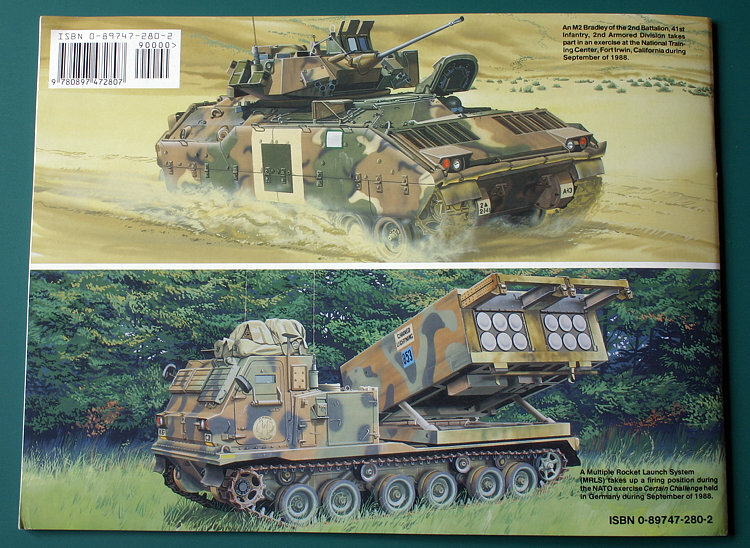 Another minor error in this chapter is in the caption of a photo showing the interior of M2, where two Dragon missile launchers are shown, but incorrectly identified as "portable TOW missile launchers". Next chapter 'M2A1 / M3A1' covers the first improved versions of Bradley vehicle and differences between them and earlier vehicles are described in text and shown on photos. Here included are 1/47 (approximately) scale drawings in four views of M3A1 CFV. I found one not fully correct information in the description of the A1 variant modifications - it says that new type TOW-2 launcher installed in A1 Bradleys can be identified by the shape of front launcher cover. Actually the newer type cover with rounded bottom edge was already used on some older TOW launchers (what by the way is clearly visible on photos of M2 on page 12) and older covers with flat bottom can sometimes be found on newer launchers (probably old spare parts still in circulation and installed on newer vehicles, even on M2A3s! ), what means that this is not really a reliable identification feature. Another minor mistake is information provided under the photo of the inner side of the upper cargo hatch of M3A1, that claims that the inside of the hatch is Pale Green (interior color). In fact insides of all hatches in M2 and M3 are always painted in base exterior color and today this means NATO green or desert tan. Following chapter provides info on the uparmored M2A2 and M3A2 variants. This time no scale plans are given. Actually even the line drawing profile of the A2 variant shown among other Bradley family vehicles on page 6 of the book is rather inaccurate and simplified, particularly compared to quite nice profiles of other versions. Obviously A2 was still new and not very well known when the book was being prepared for publication. Next chapters cover various vehicles based on Bradley hull or other components. These include ADATS anti-aircraft system, which at the time or writing of the book seemed to be on a good way to introduction into service, but since then has been cancelled and M6 Linebacker was introduced instead. Chapter 'Future Bradleys' mentions a few variants that were in development in early 1990s, but of which none have entered production. Next chapter covers another "then in development" vehicle that never entered service: Close Combat Vehicle Light (CCVL). This vehicle, designed as a replacement for M551 Sheridan did not resemble Bradley externally at all, but was designed by FMC - the manufacturers of M2 and M3 - and supposedly used some BFV (Bradley Fighting Vehicle) components. Next chapter covers vehicles based on the M987 Fighting Vehicle System (FVS) chassis, which uses Bradley suspension components to form universal platform to build various specialized vehicles. Of six development variants described in the book only one, Multiple Launch Rocket System (MLRS) entered service. The MLRS is described in the book with M933 designation. This is an error - the actual number of complete system is M270, while the base carrier vehicle, based on M987 chassis is designated M993. The book does not include any information about Command and Control Vehicle, also based on M987 chassis, which entered service with US Army as M4 C2V. The last chapter 'Into Service' provides some information about the only combat operation that Bradleys and MLRS were used in before 1992 - the Operation Desert Storm. Also mentioned and shown on photos are various training exercises in Europe and at NTC, Fort Irwin, California. Shown on single photos are MLRS vehicles used by German Bundeswehr and British Royal Artillery. 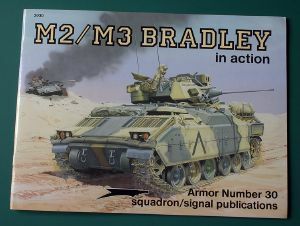 Because of its age the book does not include any information about upgraded variants of Bradley that are currently used by US Army, like M2A2 ODS (Operation Desert Storm) and M2A3. Also some specialized versions of Bradley, like M6 Linebacker anti-aircraft system and M7 BFIST (Bradley Fire Support Team Vehicle), which entered service in recent years are not covered. The combat experience described in the book only covers one very short campaign in Kuwait in Iraq in 1991. 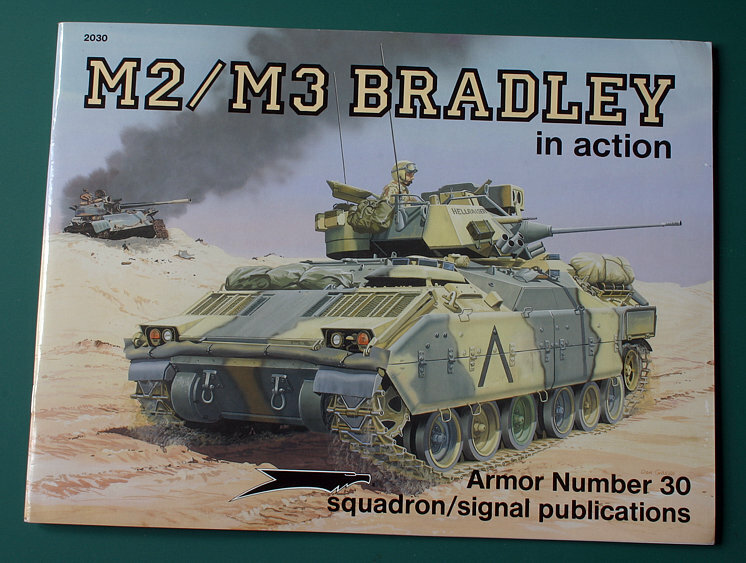 The book is a very good reference for modelers building models of early versions of Bradley vehicles. A lot of detail shots and "in action" photos from various exercises should be very useful. A few pictures from Desert Storm can also provide at least basic information on the use of Bradleys in the desert warfare. Several MLRS photos can also be useful, but information about later M2A2 and M3A2 Bradley vehicles is quite limited and those looking for references to build models of these or later variants can be disappointed and probably should look for some more up-to-date publications.